We are premium North Shore luxury bathroom designers and kitchen renovation specialists. We have over 30 years building experience and have carried out the majority of that work on the North Shore. Structural alterations are our speciality, so we can build your dream bathroom or kitchen in almost any part of your home. We are Housing Industry Association members and also insured through the H.I.A. Our team are renowned to be friendly and accommodating, people you would be happy to have in your home. Our aim is to keep our clients happy during their renovation experience, and to make your renovation as stress and hassle-free as possible. We are flexible in accommodating any changes you may have at any stage to ensure that you are completely satisfied. We understand your time is valuable and guarantee to keep our appointments or notify you if there is a change. We will do what ever is humanly possible to complete our work as per the time schedule. 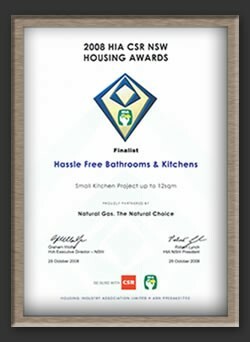 Hassle Free Bathrooms only employ highly-qualified tradesmen who are trustworthy, reliable, and friendly and will turn up when they say they will. Our entire team tradesmen share our work ethic of quality and pride in there work. Also maintaining a high standards of quality throughout the entire process of your bathroom renovation, We following the Australian Standards on all construction work. We'll arrange a time that's convenient for you to meet with us at your home. We'll then measure your bathroom - or the location you want your bathroom to be - and discuss with you what you want. We then calculate the total cost of the project and supply you with plans of your dream bathroom so you can picture the finished product in your mind. You're given a time schedule so you know exactly what's happening from start to finish and which tradesmen will be working and on what days. Then all you need to do is pick out your tiles, P.C. items, etc and we do the rest! If you have concerns or worries during your bathroom renovation you can call us at any time; we're always very happy to answer your questions. It's importat to us that you feel confident in the ability of the team and myself to produce a quality product for you.